Taking a walk through Levinsky Street (Levinsky Market neighbourhood) at midday is bewildering, beguiling and bemusing. So to find a special delicatessen/sandwic h bar amid the hustle and bustle of the meandering public is quite remarkable. 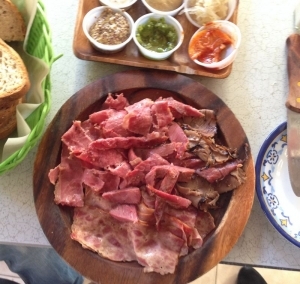 To find a kosher deli serving corn-beef, (salt-beef), roast beef, smoked duck and salamis of varying shapes and sizes is even more delightful. The exterior of Boutique Naknique (Salami/Sausage Boutique) is not what I would call inviting, although the same could be said for many eateries on Levinsky Street, but when you see the hanging salamis from the window and bottles of wine stacked on high shelving through the doorway, it is intriguing enough to enter. The place is small with a short bar and a few painted wooded stalls. Simple picnic like tables and chairs grace one side close to the windows with the hanging goods. 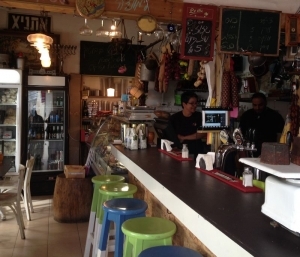 Standing at the back, a fridge containing soft drinks and along the walls intermittent units lined with kosher Israeli wines and locally brewed beers. Further along the bar is a display fridge accommodating the meaty goodies that are for sale by the gram, available for a quick sandwich or a charcuterie platter. 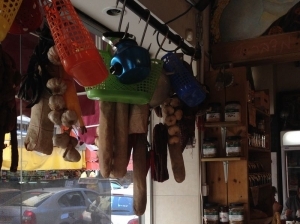 This meaty “boutique” has been established for five years and is owned by a pleasant man named Amir Yekutiel who not only works on the premises but smokes his own meats, such as the duck and corn-beef. He ensure s that all the merchandise he sells are produced in Israel and of course his meats and salamis are k osher. Not missing an opportunity for a quick snack, my hungry friends and I ordered a warm platter of meats, served with heavy rye bread and an assortment of spicy sauces, mustard, sauerkraut and pickled lemons. 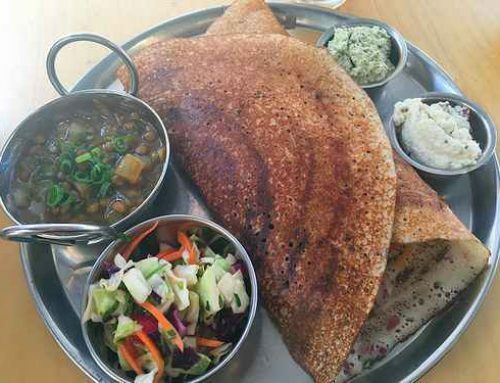 It’s a casual place where locals pop in to grab a bite or take away a some cold cuts for home and visitors come to enjoy the food and authentic atmosphere. 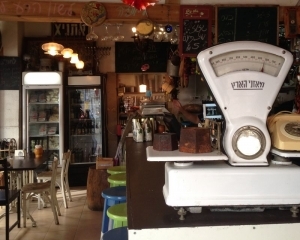 Not a New York deli but certainly a true Sweet Tel Aviv experience!